Note: This article includes a summary of the recent history of the legal and ecological status of wolves in the Great Lakes Region of the United States. This is a complex story - although I've tried to be concise, I've also tried to be thorough. Those wishing to read only a brief synopsis of the most recent status (updated July 2012) may skip ahead to the Current Status section. In the last article Part 3: Back from the Brink we examined the change in public attitudes and policies that led to a dramatic turn in the prospects for wolves in the lower 48 contiguous States of the US. After the passage of the federal Endangered Species Act (ESA) in 1973 and the subsequent protection granted to wolves in 1974, the intelligent and adaptable predator did not take long to reap the benefits of its new status in the eyes and the laws of humans. In this article we will examine the remarkable recovery of the gray wolf in the Western Great Lakes region. The few wolves that had managed to hang on in the remote forests of northeastern Minnesota had begun to increase their numbers under relaxed policies beginning in the late 1960’s, from a low of perhaps 300 to an estimated population of about 750 in 1970. By then the wolves had essentially saturated their range (located mostly within the Superior National Forest), and unless they could expand their territory there was little opportunity for further growth. In fact, the number of wolves in this area declined somewhat during the early 1970’s. The diet of wolves in this region consists primarily of white-tailed deer (about 60%) and moose (about %14)(the rest being mostly snowshoe hares and beavers), and it happened that the deer in Minnesota had recently gone through hard times. Due to the prevalence of mature forest (not rich in browse) and the harsh winters of the late 60’s, the number of deer in the state dropped so low that the hunting season (for humans) was suspended in 1971. This was a development not likely to encourage the acceptance of wolves by hunters — which, because hunters generally have the most opportunity to kill wolves, can be one of the most important factors in the successful recovery of wolf populations. Nevertheless, with bounties eliminated and federal protections in place, the wolves seized the opportunity and began to expand their range towards the northwest. Thus, while their density declined in the early part of the decade, their overall numbers continued to grow. There were perhaps 1000 wolves in Minnesota by the time the species was listed as endangered under the ESA in 1974, an estimated 1235 wolves four years later, and by 1976 it had become apparent that the species was no longer in imminent danger of extinction in the state. As a result, together with the assumption that human acceptance of wolves would be enhanced with more flexible management options in place, in 1978 the US Fish and Wildlife Service (FWS) down-listed wolves in Minnesota to “threatened.” Most significantly, this classification allowed the lethal control of wolves depredating on livestock in the state. At the same time, the FWS removed the designation of separate gray wolf subspecies from the ESA listing and extended “endangered” status to all wolves anywhere else (besides Minnesota) they would occur in the lower 48 states. Later the same year the FWS developed an “Eastern Timber Wolf Recovery Plan” setting recovery goals for gray wolves in the eastern part of the nation and recommending methods to achieve them. The plan set as its primary goal the reestablishment and maintenance of “viable populations of the Eastern Timber Wolf in as much of its former range as possible”. To achieve this goal, the plan proposed two specific sub-goals: (1) ensure the survival of wolves in Minnesota; (2) establish at least one viable population of wolves outside of Minnesota (not counting the small, isolated population on Isle Royale in Lake Superior). With wolves down-listed to threatened in Minnesota and their numbers expanding, the plan proposed ensuring the survival of wolves in the state by establishing five management zones. Zone 1 comprised a core sanctuary where wolves would be almost completely protected in what was considered the most suitable, appropriate, and crucial habitat for the species. Most appropriate meant territory most removed from human interests, and it included most of the wolves’ original refuge in the Superior National Forest. The other four zones, proceeding outward from the core towards more human settled areas, provided progressively lower goals for the density of wolves and allowed progressively more management activities to control their numbers. Wolves believed to be depredating on domestic animals in any of zones 2-5 could be killed. To achieve at least one viable population of wolves outside Minnesota, several areas east of the Mississippi believed suitable for wolf reestablishment were identified. These included northern Wisconsin, the Upper Peninsula of Michigan, northern Maine and New Hampshire, New York’s Adirondack Forest Preserve, the central Appalachians of Virginia and West Virginia, and the southern Appalachians of southwestern Virginia and northern Georgia. The plan stipulated that a “viable” wolf population would be considered established in one or more of these areas once there was either a self-sustaining population of at least 200 wolves, or 100 wolves if the area was within 100 miles of another viable wolf population. Meanwhile, the wolves in Minnesota were beginning to ensure a viable population outside the state on their own. By the late 1970s several wolves had migrated across the border into northwestern Wisconsin where they began to establish territories, breed, and raise pups. And by the late 1980s a few wolves had dispersed further east, into the Upper Peninsula of Michigan. As wolves expanded from the more remote forests of Minnesota, the potential for conflicts with humans could be expected to increase. While the northern areas of Wisconsin and Michigan are largely forested, only small areas can be considered truly wild (the largest designated wilderness area in Wisconsin is only 73 sq km), both states have lots of agriculture (Wisconsin has over 3.3 million cattle and 46% of the state is farmland) and road densities are relatively high (road density has been found to be negatively correlated with wolf survivability). Thus a crucial aspect enabling this expanding wolf population was an evolving public attitude, which was aided by public education programs conducted by wolf advocacy groups and individuals, such as Karlyn Berg, Wolf Park, the International Wolf Center, the National Wildlife Federation, the Timber Wolf Alliance, and the Wildlife Science Center. As well, the states, which had their own endangered species laws and subsequent management plans, implemented programs to provide compensation to anyone who could prove the loss of domestic animals (livestock or pets) to wolves. Consequently, the eastward migrating wolves in the late 70s and 80s tended to receive a better reception than what had occurred in 1974, when a state-managed reintroduction of four wolves into Michigan’s Upper Peninsula failed (all the wolves succumbed to human-caused mortality: three were shot and one was killed in a collision with a car). In Minnesota wolves continued dispersing into new territories and by 1992 had grown to a population of between 1500 and 1750 (two independent estimates). The increase of wolves in Wisconsin was delayed by a severe outbreak of canine parvovirus in the mid-1980s, reducing their numbers from around 27 in 1980 to around 15 in 1985, but they soon recovered and by 1990 there was a population of about 34 wolves (in ten packs) inhabiting the forests of northwestern and north-central regions of the state; by 1992 one or two wolf packs had probably also colonized the Central Forest region further south. At about the same time there was at least one reproducing pack of wolves in the Upper Peninsula of Michigan. Interestingly, while wolves seemed to be thriving in the Western Great Lakes region, so were white-tailed deer, reaching “historically” high numbers throughout the area, presumably because of an increase in favorable habitat as a result of more logging and a series of mild winters. By this time (1992) it had been determined that the original wolf of the southeastern states (at least) was a separate species, the red wolf (Canis rufus), so a revision to the ETW Recovery Plan dropped the areas in the southeastern US from consideration as possible areas for gray wolf reestablishment. In addition, provisions were added specifying criteria that would be used for down-listing wolves to “threatened” in Wisconsin and Michigan: the maintenance of a population of at least 80 wolves in each state for three years . The wolves in both states reached this number by 1995. In Minnesota, by 1997 both the range and the number of wolves had doubled since 1970, to an estimated 2450 wolves. Meanwhile, as gray wolves began migrating into the northern Rockies, and as reintroduction programs were underway for gray wolves in Yellowstone National Park and Idaho, and for Mexican gray wolves in the southwest, and for red wolves in the southeast, a nationwide strategy for wolf recovery was being developed by the FWS under the ESA. An important feature of the new plan was the division of geographically separate wolf populations into independently managed Distinct Population Segments (DSP). Throughout the late 1990s and into the 2000s there was much discussion and several proposals and public reviews about how many DPSs there should be for the gray wolf, what exactly should be their boundaries, and what should be the classification status, goals and management methods in each one. In 2003 an “Eastern Distinct Population Segment” was proposed that contained all the states in the northeast quadrant of the US, including the Western Great Lakes states. There the gray wolf would be listed as “threatened,” even though there were no known wolves anywhere in the Northeastern states (i.e., in the states east of Michigan). However, in order to give a better chance of survival to any wolves that might migrate into the Northeast, lethal control of wolves depredating on domestic animals would be limited to the Midwestern states. This rule was immediately challenged in court by various environmental and wolf advocacy groups which opposed the classification of wolves as “threatened” in such a large region most of which was still devoid of wolves. Consequent court rulings in 2005 returned “endangered” status to the wolves of Wisconsin and Michigan, taking away the option of lethal control of depredating wolves in the two states (82 wolves had been killed during the 22 months that lethal control was allowed). 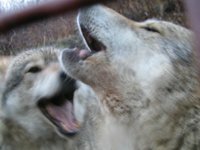 Believing that this restriction would undermine crucial public support for the return of wolves, the two state Departments of Natural Resources then applied to the FWS for permits to kill depredating wolves, which were granted under the special “takings” provision in the ESA for conservation purposes. The FWS was sued by wolf advocates again, and in 2006 the courts again revoked the lethal control of wolves outside Minnesota. The wolves of the western Great Lake States did not wait for the legal wrangling of humans. The territory occupied by wolves in Minnesota was essentially saturated and their numbers relatively stable, but the wolf populations in Wisconsin and Michigan continued to grow, to well beyond the initial ESA goals. In 2006 there were about 450 wolves in Wisconsin and about 400 in Michigan. It was believed wolves would soon migrate into Michigan’s Lower Peninsula, if they hadn’t already. Occasionally, dispersing lone wolves began showing up in places like Indiana (managing to skirt the Chicago metropolitan area), Illinois, North Dakota, South Dakota, and Missouri. Clearly, wolves were more adaptable to human proximity, and humans were more accepting of wolves, than had been expected. For example, the opposition of hunters in the Midwestern states declined, probably due to the robust populations of deer that were supporting very large harvests. On the other hand, as wolves neared the carrying capacity within their ranges, more livestock and hunting dogs were being killed, and opposition from some people was increasing. It was obvious that both wolf management goals and methods had to evolve. In order to facilitate more localized management, in 2006 the FWS proposed a separate DPS for the Western Great Lakes States (i.e., not including the Northeastern states), which was finalized in 2009 to include “all of Minnesota, Wisconsin, and Michigan; the eastern half of North Dakota and South Dakota; the northern half of Iowa; the northern portions of Illinois and Indiana; and the northwestern portion of Ohio" . Since then, shifts in the legal status of wolves in the Western Great Lakes region have continued. In 2007, wolves in the DPS were removed from the federal list of endangered species – the wolf management plans of the three states had been accepted and wolf management was turned over to the states. Then, in September 2008, as a result of more lawsuits and court rulings, the wolves in the WGLS DPS were reinstated to federal protection. The states petitioned for local management, the petitions were challenged, and on it went, and by 2009 the USFWS had issued and then rescinded a couple more rulings to remove wolves from federal listing (resulting in a brief period of state management, from May until July). In May 2011 the USFWS released a federal delisting proposal which incorporated suggested resolutions to previous challenges. In addition to removing gray wolves in the Western Great Lakes DPS from federal protection and management, this proposal also suggested that the “Eastern Wolf” (Canis lycaon) should be considered a species distinct from the gray wolf [see footnote 1, article 1] and thereby there would be no goals for restoration and no protection for gray wolves within areas in parts or all of 29 eastern states suspected to have been the historical range of eastern wolves rather than gray wolves. This provision was controversial since the historical boundary between the two proposed species, such as it may have been, could not be well known and was probably not well defined, and both animals likely existed within the Western Great Lakes region. In December 2011, after a period of public comment, the final rule was issued removing gray wolves in Michigan, Minnesota, Wisconsin, and in portions of adjoining states from the federal list of endangered species; management is assumed by the states and by Indian tribes on reservation lands. The provision establishing Canis lycaon as a distinct species was opposed by state management agencies and some scientists and was not included in the final rule, and any potential delisting of gray wolves in all or part of the other 29 eastern states was deferred. The USFWS is required to monitor wolves in the WGLDPS for five years following delisting and could re-list wolves as threatened or endangered “if necessary”. The number of wolves in Minnesota has been relatively stable for more than a decade at nearly 3000 wolves . Due to human alterations in forest composition and age, the density of wolves in the northern part of the state is probably greater than it was before the settlement of Europeans. Since 2006 there has been an average of about 200 depredation complaints a year (for livestock and other domestic animals), with about 100 verified as caused by wolves; an average of 170 wolves have been captured or killed per year for depredation control (since they were listed as threatened in the state in 1978, between 2% and 8% of the wolves have been removed for depredation control). In 2011 there were 211 depredation complaints; 109 of these were verified (88 of these livestock, 9 dogs); 215 wolves were captured and 203 killed . Subsequent to federal delisting in December 2011, wolf management was assumed by the state in January, 2012. The state’s management plan sets a goal of maintaining a minimum population of 1600 wolves . While a person anywhere in the state may kill a wolf to defend human life, the killing of wolves otherwise is subject to restrictions according to two zones. In zone A, which covers roughly the northern third of the state, owners of domestic animals may kill any wolf on land that they own or lease (or on any land in the case of a pet) that poses an “immediate threat” (i.e., is observed “…in the act of stalking, attacking or killing…”) to livestock, a guard animal, or a domestic pet under the supervision of the owner. In zone B, which covers the rest of the state, “a person may shoot a gray wolf at any time to protect livestock, domestic animals or pets on land they own, lease or manage” regardless of whether the wolf poses an immediate threat; also, persons may employ state-certified gray wolf predator control agents to trap wolves on or within one mile of land they own, lease or manage . In all cases when a wolf is killed, evidence must be preserved and the incident reported within 48 hours. In addition to lethal control actions, persons may harass any wolves within 500 yards of people, buildings or domestic animals. Indian tribes can establish different wolf management rules on their reservations, and the Red Lake Band of Ojibwe does not allow hunting or trapping of wolves on their 850,000 acre reservation. Under a bill signed into state law in May 2012, the Minnesota Department of Natural Resources established a wolf hunting and trapping season that begins on November 3, 2012, and will last until January 31, 2013 or until 400 wolves are taken, allocated in three zones (265 in the northwest zone, 117 in the northeast zone and 18 in the east-central zone). Wolves may be killed by legal firearms, bow and arrow, and by trapping, according to a two-part season: an early season corresponding with the deer hunting season and a late season beginning November 24 (trapping only allowed in the late season). 6000 licenses will be allocated by a lottery system ($4 to apply, $30 per license for residents, $250 for non-residents). More details may be found at the link in footnote . Many leaders and wildlife officials of the Ojibwe tribe opposed the wolf hunting and trapping season, citing the important role that wolves have in traditional tribal culture. Confirmed livestock depredations (deaths) by wolves in 2011 were: 64 cows/calves, 20 dogs (mostly bear hunting dogs), 28 sheep/lambs/goats, 1 horse, l llama, 2 farm deer, and 2 chickens; there were also some incidents leading to injuries. Depredation control measures consisted of installing deterrents such as fladry, flashing lights, electronic guards, or relocating livestock . In 2010 Wisconsin paid $174,780 to compensate for livestock and dog losses, up from $108,000 the year before and significantly higher than what had been originally planned in 1999 (between $20,000 and $40,000 per year); in 2010 fifteen wolves were euthanized for depredation control . In 2010, of 72 wolves found dead, 81% were human caused: 19% illegally shot, 23% lethal control, 36% vehicle collisions, 3% other. During the 2011 gun deer hunting season it is believed that at least seven wolves were illegally shot (the incidents are being investigated). A total of at least 60 wolves were illegally killed during all months from 2006 through the end of 2011 . Subsequent to federal delisting in December 2011, wolf management was assumed by the state in January, 2012. The state’s management goal is to maintain a minimum winter population of 350 wolves. Landowners or leaseholders can only shoot wolves that are observed the act of attacking domestic animals on their land, or they can apply for a permit to hunt and kill wolves which will be granted if: a confirmed attack has occurred within the last two years; the land is within one mile of a recent depredation; the land is within a pro-active control zone; there has been recent confirmed harassment of livestock; there is a human safety concern. Takings must be reported with 24 hours. Federal trappers can also be employed to remove problem wolves which will be euthanized (since wolf territory is considered saturated in the state). The first hunting and trapping season will occur from October 15, 2012 until the end of February 2013 or until the proposed quota of 201 wolves has been taken (allocated across six zones). The use of dogs (for part of the season), bait, traps, and calls (including electronic) is allowed. Nighttime hunting is allowed after the deer season ends. Weapons that may be used are legal firearms, bows and arrows, and crossbows. 2010 licenses will be allocated ($10 to apply, $100 resident license, $500 for non-resident license). There were an estimated minimum of 687 wolves in Michigan during the winter of 2010-2011, and a pack of two or three wolves is believed to have migrated into the Lower Peninsula. During 2009 (the last year for which an annual report is available) 11 cows/calves, 3 sheep/lambs, and 2 dogs were depredated by wolves in Michigan, in 14 incidents; a total of $4,686.50 was paid in compensation. Past trends suggest that there will be about three depredations of livestock per 100 wolves per year in Michigan . Between 1999 and 2005 annual wolf mortality ranged between 15% and 46% (depending on the method of analysis). In 2009 the known wolf mortality was 34 wolves. Of these, 15 wolves were killed illegally, 13 were killed by vehicle collisions, 2 were killed for depredation control, and one was killed for posing “a demonstrable but non-immediate threat to human safety” . One wolf was known to have been illegally shot during the 2011 gun deer hunting season. Subsequent to federal delisting in December 2011, wolf management was assumed by the state in January 2012. The state’s management plan sets a goal to maintain a minimum population of 200 wolves, although it specifically does not set a target population goal, which it recognizes could be higher to be consistent with public values. Wolves remain a protected, nongame animal but livestock and pet owners or their designated agents may remove, capture, or kill any wolf observed attempting to injure or kill their animals. In cases of lethal action the wolf’s body must be left in place (unless it would jeopardize farming operations) and the kill reported within 12 hours. With the federal delisting decision in December 2011, gray wolves are not under federal management or protection in all of the Western Great Lakes DPS, which in addition to Minnesota, Wisconsin, and Michigan, includes portions of Ohio (the region north of I80 and west of the Maumee River), Indiana (the region north of I80), Illinois (the region north of I80), the northern two-thirds of Iowa (the region north of I80), and eastern South Dakota and North Dakota. Lone dispersers have been occasionally spotted in some of these states (and beyond: in 2011 a wolf was killed in Missouri that had dispersed from Michigan). In 2011, two men were charged with illegally killing a wolf (each) in Illinois. The current number of wolves in Minnesota is nearly twice, and in Wisconsin more than twice, the goals set in the state recovery plans, which were based on “best” (albeit conservative) guesses about the ecological and social carrying capacities at the time they were formulated. Yet, as the wolf populations of the Western Great Lakes region continue to expand into areas with more humans, and as humans continue to expand into areas with more wolves, conflicts are increasing, and the ever fragile truce between the two apex predators is being challenged . The example of these wolves has demonstrated that public acceptance is almost always the most crucial factor determining the prospects for survival of wolves in the wild. The Wisconsin state plan formulated in 1989 was consistent with the federal plan, setting a down-listing criteria of at least 80 wolves for three consecutive years. In Michigan, the state plan specified that wolves would be considered recovered when a population of at least 200 wolves existed for five consecutive years. Most recent population estimate (end of 2010) in Minnesota: 2921. Population goals in state management plans are usually specified as minimum winter populations (of course populations temporarily increase when pups are born each spring). In 2010 there were also nine “health and safety” incidents involving habituated/aggressive wolves, although there were no “immediate” threats to humans. Through October 2010, it had been confirmed that wolves had killed so far that year two dogs, seven sheep, 55 cattle, and a Guinea hen. Evidence suggests that deer numbers in the Western Great Lake region are far more dependent on weather and browse availability than on the presence of wolves. A recent study in the UP of Michigan found that coyote predation of deer was higher than wolf predation. This article is current as of July, 2012. The status of wolves in the United States changes rapidly. Updates will occasionally be provided.